Injuries of the subaxial cervical spine (C3-7) are among the most common and potentially most devastating injuries involving the axial skeleton. The cervical spine often is injured in motor vehicle accidents and falls, resulting in bony or soft-tissue injury; however, the presence of multiple traumatic injuries may distract the examiner from the cervical spine. In the evaluation of the polytrauma patient, examining the cervical spine is a high priority and must take precedence. The cervical spine is important to consider in positioning the head in space. The dominant motion in the lower cervical spine is flexion-extension, but the cervical spine's anatomy permits a fair amount of motion in all planes. In high-speed injuries, the head can act as a significant lever arm on the cervical spine and, depending on the mechanism, can create a wide array of injury patterns. The lower cervical spine can suffer minor bony or ligamentous injury that nevertheless results in severe neurologic injury. However, the converse is also true: major bony or ligamentous injury to the lower cervical spine can present with only neck pain. Thus, a thorough and orderly approach to the examination is paramount. Recognizing injury to the lower cervical spine is important because of the association between these injuries and spinal cord and nerve root injury. Little room for malalignment exists in the lower cervical spine, and safe and expeditious realignment is of the utmost priority. In patients presenting to an emergency facility with a history of a high-speed motor vehicle accident, significant head or facial trauma, a neurologic deficit, or neck pain, a cervical spine injury should be assumed to be present until proved otherwise. 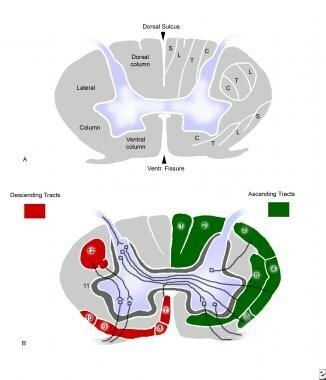 Whereas assessment of airway, breathing, and hemodynamic stability continues to be the highest priority in caring for the patient with multiple traumatic injuries, central nervous system (CNS) evaluation follows closely behind. The CNS assessment begins in the field; the cervical spine is protected until workup proves that it is not injured. Operative stabilization of the cervical spine was introduced by Hadra in 1891, when he wired the spinous processes of a child who had a fracture dislocation with progressive neurologic deterioration. This was the first surgical procedure of its kind recorded in the literature. Further refinement in the application of internal fixation was documented by Rogers in 1942 with a simple wire technique, and by Bohlman with the use of triple wire stabilization. Rogers reported successful fusions in 37 of 39 patients with 1-12 years of follow-up. Bohlman's technique involved using separate wires for fixation of the adjacent spinous processes and compression of two corticocancellous grafts against the spinous processes. Biomechanically, this was thought to provide better flexural and torsional stiffness than Rogers' simple wiring. Weiland and McAfee reported 100% fusion rates in 60 patients using this means of fixation in the subaxial cervical spine. Roy-Camille pioneered the use of posterior cervical plates to manage a variety of injuries involving the posterior subaxial spine. Magerl, Anderson, and An proposed variations of screw insertion techniques. Anterior spinal reconstructions evolved from the use of grafts alone (iliac crest, fibula) supported with external immobilization (halo vest), to the use of anterior instrumentation with plates and bicortical screw fixation (Caspar), to unicortical locking plates (Morscher Synthes cervical spine locking plate [CSLP] system). Skull traction using modified ice tongs was introduced by Crutchfield in 1933. The halo device was pioneered by Nickel and Perry in the late 1950s, primarily to immobilize the cervical spine affected by polio. Its application was extended to trauma cases, providing a better means of immobilization. The subaxial cervical spine can conveniently be divided into anterior and posterior columns. The anterior column consists of the typical cervical vertebral body sandwiched between supporting disks. The anterior surface is reinforced further by the anterior longitudinal ligament, and the posterior body by the posterior longitudinal ligament, both of which run from the axis to the sacrum. Articulations include the disk-vertebral body, uncovertebral joints, and zygapophyseal joints. Normal anatomy of the lower cervical spine. Cross-sectional anatomy of the cervical cord. Interconnections are present between the sympathetic nervous system and the nerve root proper. Because the numbering of the cervical roots commences above the atlas, eight cervical roots exist, with C8 exiting between the seventh cervical vertebra and the first thoracic level. The vascular anatomy consists of a larger anterior spinal artery located in the central sulcus of the cord and paired posterior spinal arteries located on the dorsum of the cord. The anterior two thirds of the cord is generally accepted to be supplied by the anterior spinal artery, and the posterior one third is generally accepted to be supplied by the posterior arteries. Various mechanisms may be responsible for ligamentous and bony failure in the subaxial cervical spine. The importance of the position of the head and neck at the time of impact and the direction of force causing injury cannot be overemphasized. Clinical examination and critical review of the imaging studies help determine the type of failure and, therefore, the reconstruction required. 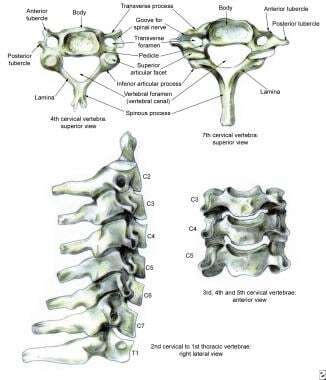 Conceptually, the cervical spine may be viewed as being composed of two columns. An anterior load-bearing structure consists of all structures anterior to and including the posterior longitudinal ligament. The posterior column includes the pedicles, laminae, facet joints, spinous processes, and the posterior ligament complexes (ligamentum flavum, interspinous ligaments, and supraspinous ligaments). Tension is resisted by the posterior column, which fails under extreme flexion or distraction and which may be associated with concomitant injury to the anterior column. Cervical spine injury has been reported in 2-4.6% of patients presenting with blunt trauma. It is the most devastating musculoskeletal injury and occurs most frequently in young patients. Spinal cord injury occurs in more than 11,000 patients per year, or in 40-50 persons per 1 million population. Injuries to the cervical spine produce neurologic damage in approximately 40% of patients. In approximately 10% of traumatic cord injuries, radiographs reveal no obvious evidence of bony abnormality. The clinical outcome after lower cervical spinal injury generally is related to the level and severity of associated spinal cord injury. Incomplete spinal cord injuries, as defined by objective motor or sensory preservation below the level of trauma, have the potential for recovery. In general, the sooner the evidence of return, the better the overall prognosis, though recovery may continue for 1 year or longer. The life expectancy of patients with cervical spinal cord injuries has increased with better management of urinary complications. Urinary complications are no longer among the most common causes of death after the first year after injury. Uhrenholt L, Charles AV, Hauge E, Gregersen M. Pathoanatomy of the lower cervical spine facet joints in motor vehicle crash fatalities. J Forensic Leg Med. 2009 Jul. 16(5):253-60. [Medline]. Kouyoumdjian P, Guerin P, Schaelderle C, Asencio G, Gille O. Fracture of the lower cervical spine in patients with ankylosing spondylitis: Retrospective study of 19 cases. Orthop Traumatol Surg Res. 2012 Sep. 98(5):543-51. [Medline]. Milligram MA, Rand N. Cervical spine anatomy. Spine State of the Art Reviews. 2000. 14(3):521-32. Allen BL Jr, Ferguson RL, Lehmann TR, O'Brien RP. A mechanistic classification of closed, indirect fractures and dislocations of the lower cervical spine. Spine (Phila Pa 1976). 1982 Jan-Feb. 7 (1):1-27. [Medline]. Zehnder SW, Lenarz CJ, Place HM. Teachability and reliability of a new classification system for lower cervical spinal injuries. Spine (Phila Pa 1976). 2009 Sep 1. 34(19):2039-43. [Medline]. Hubbard ME, Jewell RP, Dumont TM, Rughani AI. Spinal injury patterns among skiers and snowboarders. Neurosurg Focus. 2011 Nov. 31(5):E8. [Medline]. [Guideline] Hadley MN, Walters BC, Aarabi B, Dhall SS, Gelb DE, Hurlbert RJ, et al. Clinical assessment following acute cervical spinal cord injury. Neurosurgery. 2013 Mar. 72 Suppl 2:40-53. [Medline]. [Full Text]. Vaccaro AR, Hulbert RJ, Patel AA, Fisher C, Dvorak M, Lehman RA Jr, et al. The subaxial cervical spine injury classification system: a novel approach to recognize the importance of morphology, neurology, and integrity of the disco-ligamentous complex. Spine (Phila Pa 1976). 2007 Oct 1. 32 (21):2365-74. [Medline]. [Guideline] Aarabi B, Walters BC, Dhall SS, Gelb DE, Hurlbert RJ, Rozzelle CJ, et al. Subaxial cervical spine injury classification systems. Neurosurgery. 2013 Mar. 72 Suppl 2:170-86. [Medline]. [Full Text]. Platzer P, Hauswirth N, Jaindl M, Chatwani S, Vecsei V, Gaebler C. Delayed or missed diagnosis of cervical spine injuries. J Trauma. 2006 Jul. 61(1):150-5. [Medline]. Silva CT, Doria AS, Traubici J, Moineddin R, Davila J, Shroff M. Do additional views improve the diagnostic performance of cervical spine radiography in pediatric trauma?. AJR Am J Roentgenol. 2010 Feb. 194(2):500-8. [Medline]. Antevil JL, Sise MJ, Sack DI, Kidder B, Hopper A, Brown CV. Spiral computed tomography for the initial evaluation of spine trauma: A new standard of care?. J Trauma. 2006 Aug. 61(2):382-7. [Medline]. [Guideline] Ryken TC, Hadley MN, Walters BC, Aarabi B, Dhall SS, Gelb DE, et al. Radiographic assessment. Neurosurgery. 2013 Mar. 72 Suppl 2:54-72. [Medline]. [Full Text]. Eismont FJ, Arena MJ, Green BA. Extrusion of an intervertebral disc associated with traumatic subluxation or dislocation of cervical facets. Case report. J Bone Joint Surg Am. 1991 Dec. 73 (10):1555-60. [Medline]. Toh E, Nomura T, Watanabe M, Mochida J. Surgical treatment for injuries of the middle and lower cervical spine. Int Orthop. 2006 Feb. 30(1):54-8. [Medline]. Marco RA, Meyer BC, Kushwaha VP. Thoracolumbar burst fractures treated with posterior decompression and pedicle screw instrumentation supplemented with balloon-assisted vertebroplasty and calcium phosphate reconstruction. Surgical technique. J Bone Joint Surg Am. 2010 Mar. 92 Suppl 1 Pt 1:67-76. [Medline]. Kim HJ, Lee KY, Kim WC. Treatment outcome of cervical tear drop fracture. Asian Spine J. 2009 Dec. 3(2):73-9. [Medline]. [Full Text]. Dvorak MF, Fisher CG, Aarabi B, Harris MB, Hurbert RJ, Rampersaud YR, et al. Clinical outcomes of 90 isolated unilateral facet fractures, subluxations, and dislocations treated surgically and nonoperatively. Spine. 2007 Dec 15. 32(26):3007-13. [Medline]. [Guideline] Gelb DE, Aarabi B, Dhall SS, Hurlbert RJ, Rozzelle CJ, Ryken TC, et al. Treatment of subaxial cervical spinal injuries. Neurosurgery. 2013 Mar. 72 Suppl 2:187-94. [Medline]. [Full Text]. Tsutsumi S, Ueta T, Shiba K, Yamamoto S, Takagishi K. Effects of the Second National Acute Spinal Cord Injury Study of high-dose methylprednisolone therapy on acute cervical spinal cord injury-results in spinal injuries center. Spine. 2006 Dec 15. 31(26):2992-6; discussion 2997. [Medline]. Bracken MB, Holford TR. Neurological and functional status 1 year after acute spinal cord injury: estimates of functional recovery in National Acute Spinal Cord Injury Study II from results modeled in National Acute Spinal Cord Injury Study III. J Neurosurg. 2002 Apr. 96(3 Suppl):259-66. [Medline]. Young W, Bracken MB. The Second National Acute Spinal Cord Injury Study. J Neurotrauma. 1992 Mar. 9 Suppl 1:S397-405. [Medline]. Bracken MB, Shepard MJ, Hellenbrand KG, Collins WF, Leo LS, Freeman DF, et al. Methylprednisolone and neurological function 1 year after spinal cord injury. Results of the National Acute Spinal Cord Injury Study. J Neurosurg. 1985 Nov. 63(5):704-13. [Medline]. Fehlings MG. Summary statement: the use of methylprednisolone in acute spinal cord injury. Spine. 2001 Dec 15. 26(24 Suppl):S55. [Medline]. Hugenholtz H, Cass DE, Dvorak MF, et al. High-dose methylprednisolone for acute closed spinal cord injury--only a treatment option. Can J Neurol Sci. 2002 Aug. 29(3):227-35. [Medline]. [Guideline] Hurlbert RJ, Hadley MN, Walters BC, Aarabi B, Dhall SS, Gelb DE, et al. Pharmacological therapy for acute spinal cord injury. Neurosurgery. 2013 Mar. 72 Suppl 2:93-105. [Medline]. Fehlings MG, Bracken MB. Summary Statement: The Sygen(R) (GM-1 Ganglioside) Clinical Trial in Acute Spinal Cord Injury. Spine. 2001 Dec 15. 26(24 Suppl):S99-S100. [Medline]. Segal JL, Pathak MS, Hernandez JP, et al. Safety and efficacy of 4-aminopyridine in humans with spinal cord injury: a long-term, controlled trial. Pharmacotherapy. 1999 Jun. 19(6):713-23. [Medline]. Sapkas GS, Papadakis SA. Neurological outcome following early versus delayed lower cervical spine surgery. J Orthop Surg (Hong Kong). 2007 Aug. 15(2):183-6. [Medline]. Furlan JC, Noonan V, Cadotte DW, Fehlings MG. Timing of decompressive surgery of spinal cord after traumatic spinal cord injury: an evidence-based examination of pre-clinical and clinical studies. J Neurotrauma. 2011 Aug. 28(8):1371-99. [Medline]. [Full Text]. Fehlings MG, Vaccaro A, Wilson JR, et al. Early versus delayed decompression for traumatic cervical spinal cord injury: results of the Surgical Timing in Acute Spinal Cord Injury Study (STASCIS). PLoS One. 2012. 7(2):e32037. [Medline]. [Full Text]. Apple DF. Spinal cord injury rehabilitation. Garfin SR, Vaccaro AR, eds. Orthopaedic Knowledge Update: Spine. Rosement, IL: American Academy of Orthopaedic Surgeons; 2002. Vol 2: 239-44. Levine AM. Facet fractures and dislocations. Lampert R, ed. Spine Trauma. Philadelphia: WB Saunders; 1998. 331-65. Lateral film of a C5 burst/teardrop fracture. Sagittal CT scan of C5 burst fracture. Axial CT scan of C5 burst fracture. Reduction of C5 burst fracture after tongs traction. Postoperative image of C5 burst fracture; note anterior and posterior fixation. Postoperative image of C5 burst fracture. Standard lateral cervical spine of an 80-year-old patient after a motor vehicle accident; patient has no neurologic deficits and no neck pain. Swimmer's view of the same 80-year-old patient as in Image 9; note the C7-T1 fracture/dislocation. Axial CT scan of C7-T1 fracture/dislocation. Sagittal CT of C7-T1 fracture/dislocation. Postoperative anteroposterior view of C7-T1 fracture/dislocation. Postoperative lateral view of C7-T1 fracture/dislocation. Disclosure: Received income in an amount equal to or greater than $250 from: Globus medical, Nuvasive<br/>Received consulting fee from Nuvasive for speaking and teaching; Received royalty from Globus for consulting. The authors and editors of Medscape Reference gratefully acknowledge the contributions of previous author Samuel Hu, MD, to the development and writing of this article.